Playing with Electrons to Make Stories: Brain-Themed Pin OR A new item with improved mechanics and color! Brain-Themed Pin OR A new item with improved mechanics and color! Hi folks! Here is a Brain-Themed pin whose stats work equally well for OSR/OD&D as well as 5e. 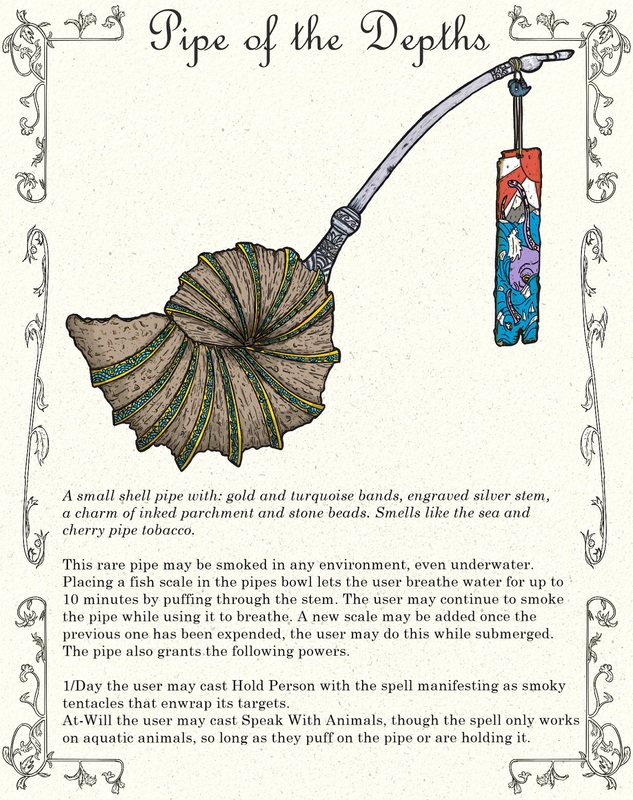 I have also included an improve versions of my crazy magic pipe in super-awesome color! A pin the length of an adult’s hand. Its head, shaped like a human brain, is hollow and made of milky quartz. Below the brain: vertebrae cast in platinum, discs made of gold, red copper nerve bundles protruding from the spine, a hollow needle shaft crafted from silver. This very rare item requires attunement. Once it is attuned, it grants a +1 bonus to Intelligence to a maximum score of 20. 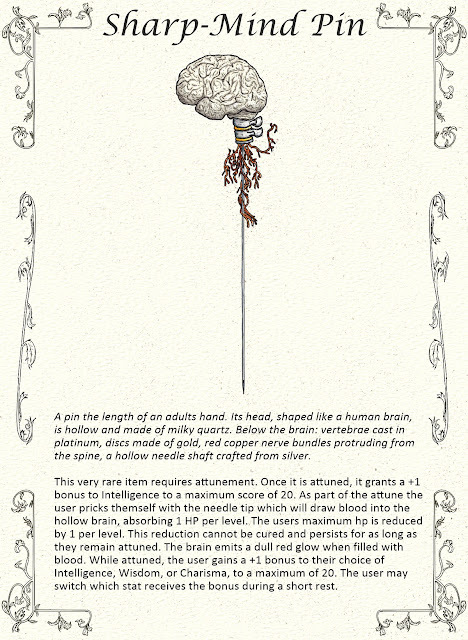 As part of the attune the user pricks themself with the needle tip which will draw blood into the hollow brain, absorbing 1 HP per level. The user’s maximum hp is reduced by 1 per level. This reduction cannot be cured and persists for as long as they remain attuned. The brain emits a dull red glow when filled with blood. 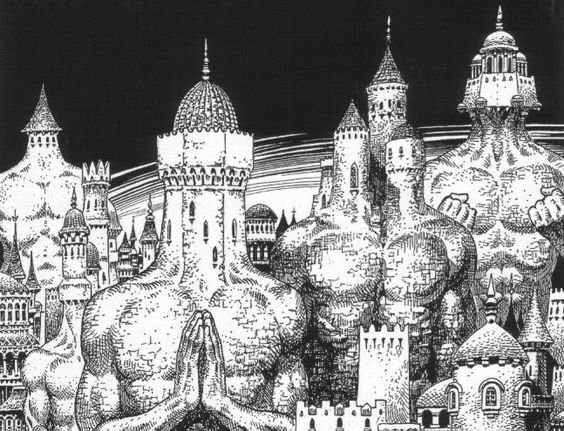 While attuned, the user gains a +1 bonus to their choice of Intelligence, Wisdom, or Charisma, to a maximum of 20. The user may switch which stat receives the bonus during a short rest. A small shell pipe with: gold and turquoise bands, engraved silver stem, a charm of inked parchment and stone beads. Smells like the sea and cherry pipe tobacco. This rare pipe may be smoked in any environment, even underwater. Placing a fish scale in the pipe’s bowl lets the user breathe water for up to 10 minutes by puffing through the stem. The user may continue to smoke the pipe while using it to breathe. A new scale may be added once the previous one has been expended, the user may do this while submerged. The pipe also grants the following powers. At-Will the user may cast Speak With Animals, though the spell only works on aquatic animals, so long as they puff on the pipe or are holding it. 1/Day the user may cast Hold Person with the spell manifesting as smoky tentacles that enwrap its target.